The safest place for your child’s car seat is the back seat, away from active air bags. 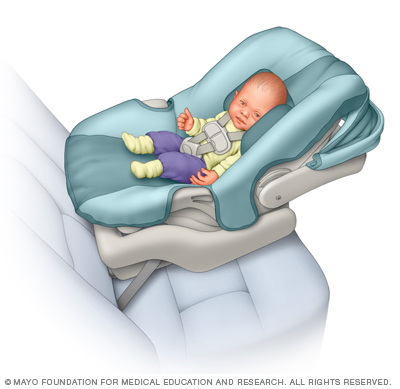 If the car seat is placed in the front seat and the air bag inflates, it could hit the back of a rear-facing car seat — right where your child’s head is — and cause a serious or fatal injury. A child who rides in a forward-facing car seat could also be harmed by an air bag.If it’s necessary for a child to travel in a vehicle with only one row of seats, deactivate the front air bags or install a power switch to prevent air bag deployment during a crash. 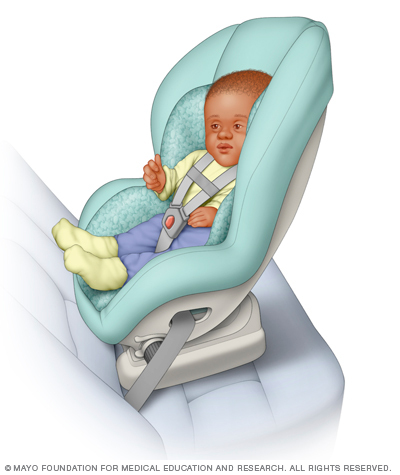 A car seat is designed to protect your child during travel. It’s not for use as a replacement crib in your home. A 2009 study showed that sitting upright in a car seat might compress a newborn’s chest and lead to lower levels of oxygen. Even mild airway obstruction can impair a child’s development.Sitting in a car seat for lengthy periods can also contribute to the development of a flat spot on the back of your baby’s head and worsen gastroesophageal reflux disease (GERD) — a chronic digestive disease. In addition, a child can easily be injured by falling out of an improperly used car seat or while sitting in a car seat that falls from an elevated surface, such as a table. Although it’s essential to buckle your child into a car seat during travel, don’t let your child sleep or relax in the car seat for long periods of time out of the car. In the rear-facing position, recline the car seat according to the manufacturer’s instructions so that your child’s head doesn’t flop forward. Many seats include angle indicators or adjusters. You can also place a tightly rolled towel under the seat’s front edge to achieve the right angle.To prevent slouching, place tightly rolled baby blankets alongside your newborn. If necessary, place a rolled washcloth between the crotch strap and your baby to prevent slouching. Don’t use any additional products unless they came with the car seat or from the manufacturer. Booster seats must be used with a lap and shoulder belt — never a lap-only belt. Make sure the lap belt lies low and snug across your child’s upper thighs and that the shoulder belt crosses the middle of your child’s chest and shoulder.Some booster seats come without backs. Backless booster seats also must be used with a lap and shoulder belt — never a lap-only belt. If your vehicle has low seat backs or doesn’t have a headrest to protect your child’s head and neck in a crash, consider using a high-back booster that fits your child’s height and weight.